Social media star: In November 2013, Seth’s blog post entitled “Marriage Isn’t for You” garnered more than 30 million hits and resulted in interviews onGood Morning America, Fox News, and media coverage around the world. Heartfelt and moving: Smith writes candidly, and at times with disarming humor, about his struggles with addiction and depression, his suicide attempt, and the happiness he discovered by focusing on others. In Your Life Isn’t for You, Seth Adam Smith expands on the philosophy outlined in his popular blog post “Marriage Isn’t for You,” which received over 30 million hits and has been translated into twenty languages (and counting). 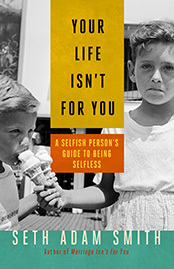 In this inspiring, funny, and moving book—a welcome antidote to the modern obsession with self—Seth shows how his philosophy of living for others can enrich every aspect of your life, just as it has his. Seth writes not as an expert but as a flawed human being sharing what he’s learned—and learned the hard way. He reveals how, years before his marriage, his self-obsession led to a downward spiral of addiction and depression, culminating in a suicide attempt at the age of twenty. It was the love and support Seth experienced in the aftermath, which he so poignantly depicts here, that opened his eyes to the dead end (literally) of selfishness. With a mix of humor, candor, and compassion, he reflects on the experiences in his life—his difficult missionary stint in Russia, his time as a youth leader in the Arizona desert, his marriage, even a children’s story his father read to him—that led to his conviction that the only way you can find your life is to give it away to others.